Aptly known as the fabulous green sphinx moth, Tinostoma smaragditis has captivated and eluded scientists for over a century. Bestowed with vibrant green wings and thorax, pale brown hind wings and orange antennae, this exquisite moth was thought to be extinct until 1998. The male and female fabulous green sphinx moth can be distinguished by the underside of the wings, which are pale green on the female and pinkish-brown on the male. Most strikingly, however, the male displays a black collar around its thorax and a black spot on each forewing. 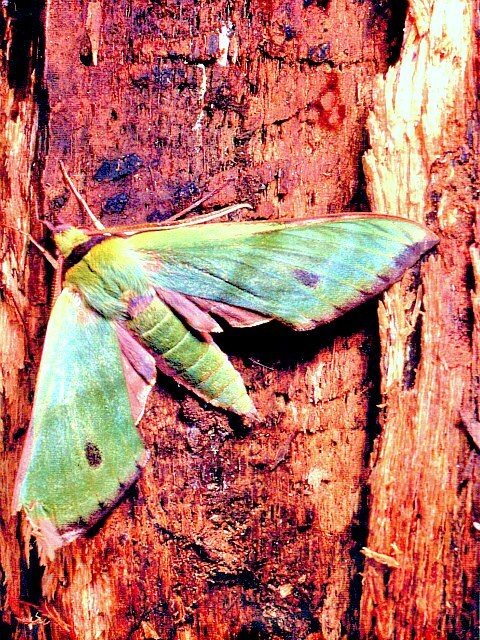 The distinctive larva of the fabulous green sphinx moth has a reddish caudal horn which measures around half the length of the body.